We service all brands of high speed, low speed, air, electric and surgical. Ship your handpiece to me today. You will experience fast, personal service at a price that will make you smile. 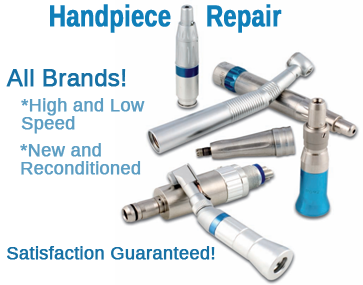 We’re your professional dental handpiece repair facility in operation since 1997. 1 Year Warranty $165 includes complete turbine rebuild, handpiece cleaning and basic water and air line cleaning, performance and safety tests. We offer dental turbines for Star, Kavo, Midwest, Lares, Sirona, plus a full range of cleaning, lubrication, and replacement parts for high and low-speed dental handpieces. Why use Hughes for your handpiece service and repairs? Experience: With over 21 years’ experience we are still growing strong! Guarantee: We guarantee maximum value for your repair dollar. Quality: Quality repairs using the highest quality parts available, many exceeding OEM standards. Satisfaction: If you’re not happy, we’re not happy. Dental handpiece repair problems are the last thing you want to deal with, and so is a repair shop that is here today and gone tomorrow. *Can your current handpiece repair shop provide you with high quality repair for virtually every brand of dental handpiece and attachment? * Can they offer fiber optic replacement, re-braze loose heads, service all low speeds and repair surgical dental handpieces? * Do they offer electric dental handpiece repair at a price that will make you smile? 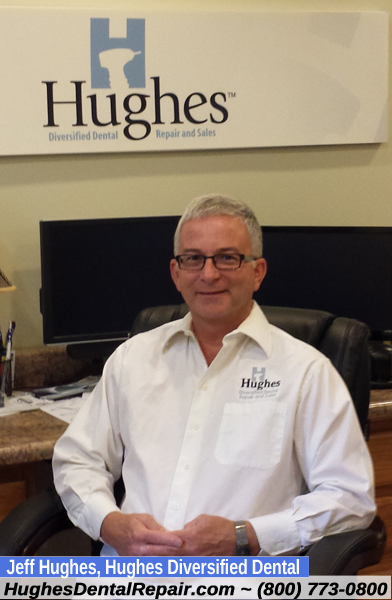 Hughes is a family owned, professional dental handpiece repair facility in operation since 1997.